Temporarily relieves these symptoms due to hay fever or other respiratory allergies: -runny nose - sneezing - itchy, watery eyes - itching of the nose or throat. Do not useif you have ever had an allergic reaction to this product or any of its ingredients or to an antihistamine containing hydroxyzine. Ask a doctor before use if you have liver or kidney disease. Your doctor should determine if you needs different dose. 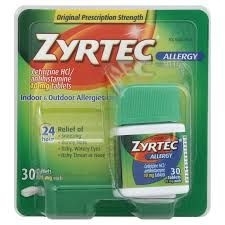 If you have a question about this product, please call 1-800-343-7805 or visit www.zyrtec.com.